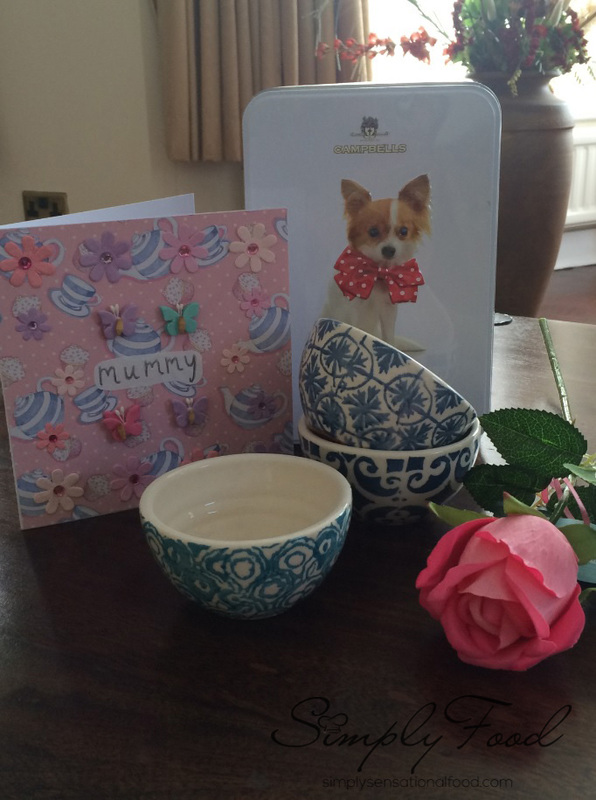 This year mother’s day was a rather subdued and quiet affair for me. Neither of my girls were around to pamper me and I also had to go to work. My sunday morning started with a hot cup of masala tea with my daughter followed by breakfast. I didn't have time for a large cooked breakfast but I really enjoyed my porridge with bananas and a helping of delicious Rachel's Banana and Dulce de Leche yoghurt. There was still time left to enjoy another cup of masala tea and round of hot buttery toast before venturing out to work on a cold and icy day. Most of my followers know that I love kitchenware and cookware so I was really pleased to find that my girls had bought me three very cute little ceramic bowls in different pattern in blue, some delicious shortbread cookies and some flowers. The best bit was the lovely homemade Mother's Day card that the girls made. We had no plans for eating out but when I returned home from work, there was a delicious aroma that had filled the kitchen. Hubby was preparing a lovely mother's day dinner so I was banished from the kitchen while my daughter and him added the finishing touches on the meal. I really enjoyed my day despite the fact that I did not get to spend the whole day with the family, but I guess quality time is more important than quantity. My surprises were not over, I was also presented with a lovely homemade chocolate cake served with creamy rich and decadent scoops of my favorite Haagen Dazs Cookies and Cream and Pralines and Cream ice cream. Obviously after such an indulgent dessert we had to eat something healthy while we all enjoyed a family movie nite. The bowl of sweet juicy strawberries were simply delicious to munch on despite being out of season. I always believe that the act of caring is what makes a day special not expensive presents or elaborate outings. My day was perfect and the added bonus was I didn't even have to do the washing up!!!!! How was your Mother's Day??? 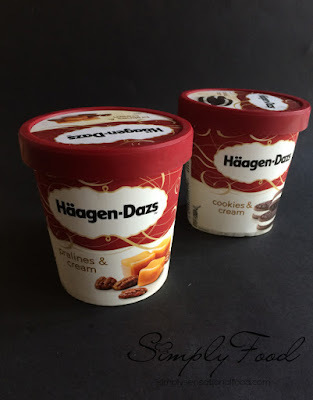 Disclaimer: I was sent vouchers to purchase the Haagen Daz ice cream and Rachel's Yoghurts. Omg! Haagen Daz the best ice cream ever! My mum celebrates Mother's Day on 26 May so I still have a bit of time but I also think it is acts of kindness and love that make this day special, not fancy gifts. I do love Pralines & Cream Haagen Dazs too;-) Glad you had a lovely Mother's Day evening and as you say it's quality not quantity! It sounds like you had a wonderful day with lots of lovely treats. 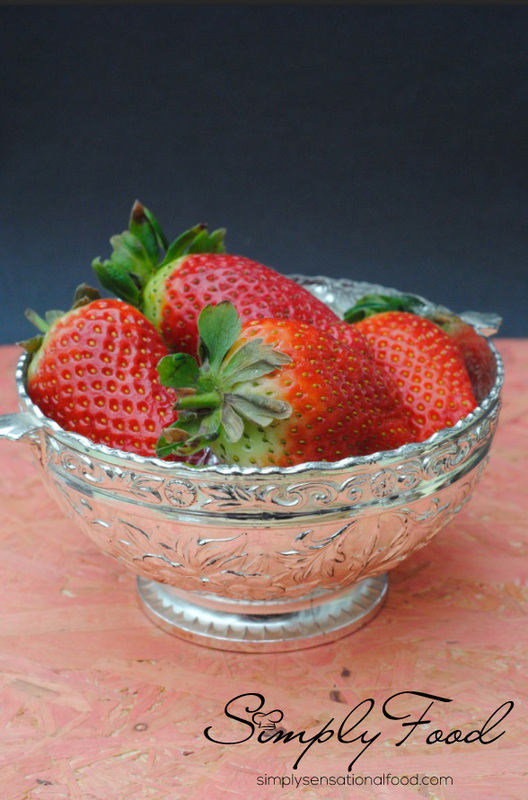 I love your little bowls, how sweet. Always miss my kids on such special days.. I had an outing with hubby.. lunch at friend's place and saw a movie later. How lovely to have your dinner cooked for you - that's always a treat! I spent Mother's Day with my favourite people in the world so you can't get much better than that! My Mum celebrates mother's day on the 21st of March, but today we celebrate international women's day! (my Mum is Russian!) So happy women's day! And I love haagen dazs yum! Haagan Daz is my favourite ice cream! Love the stuff. Banana and Dulce de leche yogurt sounds good.None of my kids are with me and anyway they follow the other Mother's Day date. However,did enjoy a movie and Italian cuisine. Girls always know how to make mothers feel special. I had a lovely day! The kids had lots of little surprises for me that they made themselves and they were just so lovely all day. I love Haagen Dazs. Salted caramel chocolate is my absolute favourite! Your Mothers Day sounds absolutely lovely and I love the gift that your daughters got you. Looks like you had a chilled Mother's Day. Loving the cake. These are such nice surprises! I'm glad your Mothers' Day was great. It looks like you had a great day and I just love those bowls. Nayna, it sounds like a perfect day and you were thoroughly spoiled, even if you did have to work. Love those bowls and the cake looks amazing. I adore that they made up for not being there by banishing you from the kitchen! 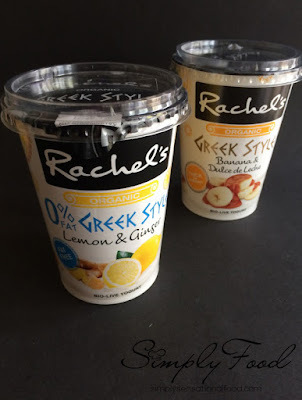 I love Greek yoghurt and Rachels is really thick and yummy! 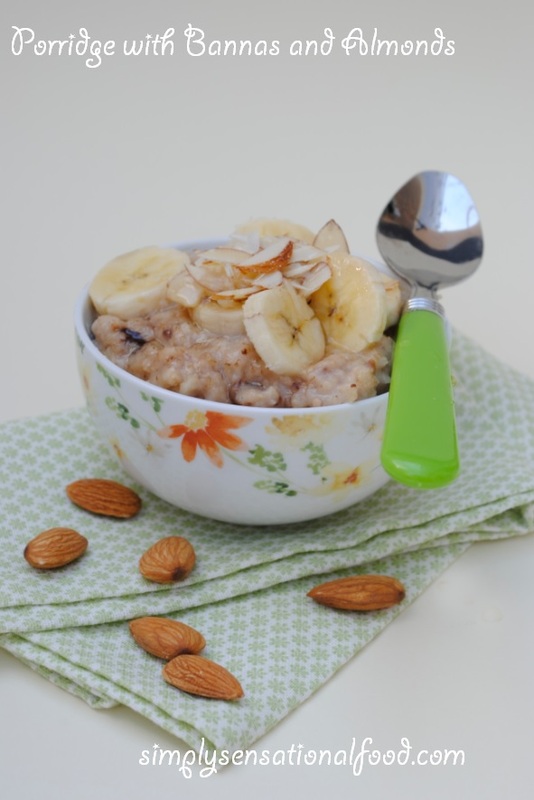 The bowls are really cute. 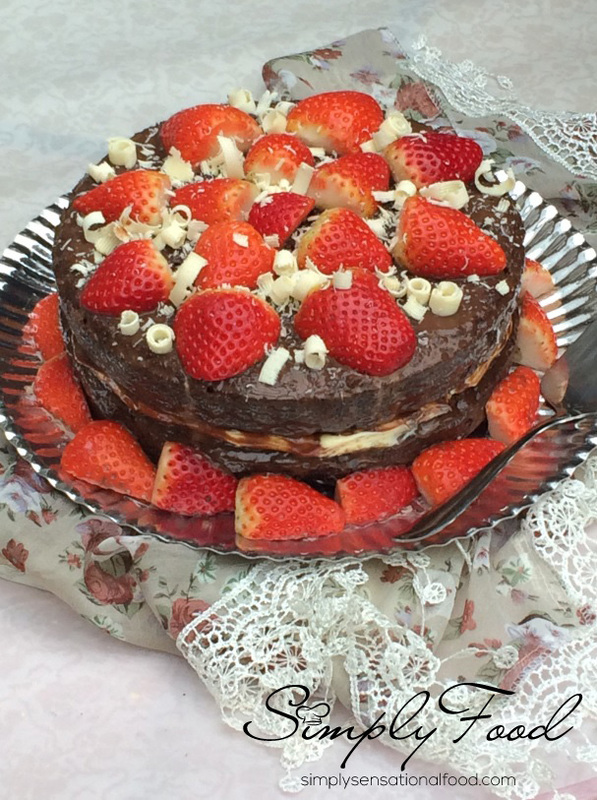 I could really do with a slice of that cake right now! I agree that it's not the gifts that matter but the caring. I love chatting to the family on Mother's Day either on the phone or in person if I'm lucky. This year, it was on the phone and I really enjoyed the catch up. Although it's sad that your girls weren't around this year, sometimes quiet days can be really nice as it gives you some 'me time'. That chocolate cake looks absolutely delicious.